When do the events start? What about the weather in Hyderabad on the race weekend? The weather in Hyderabad is generally pleasant, with temperatures of 25 to 32 degrees C. However, humidity may be as high as 50%. Sudden showers may be expected, and they are usually short. Runners are requested to dress appropriately and ensure they are sufficiently hydrated throughout the course. Will the event be called off incase of heavy rain? There have been sudden showers during the previous editions of the Hyderabad Marathon. The event went ahead despite these as they were just cloudbursts. Calling off the event due to unfavourable weather is at the discretion of the organizers. We believe that the well-being of the runners is priority and any weather conditions which necessitate the race being called off will be deliberated thoroughly by the organizers before a decision is taken. There will be no refund of the registration fee in case the race is called off due to weather or any other acts of God (force majeure clauses) and the decision of the Race Director is final in this regard. Are there cut off times for all the events? All participants finishing within this time will receive the finishers medal and certificate. Can I use IPOD / Head Phones during the course of the race? Yes!! We believe music is a great aid to running. However, please be alert to route signages, announcements from the race marshals and traffic (in case you exceed event cut off times). Will there be AID Stations and emergency medical assistance available along the route? Is there a place to store my baggage on Race day? If you are carrying any baggage on the Race day, it will be collected by us at the start point and handed back to you at the finish point. All baggage will be screened for security reasons and the organizers of the Hyderabad Marathon are not responsible for any losses or damage to the contents. We recommend not having anything valuable or fragile in your bag. Restrictions on size and weight of baggage will apply and will be made known in the Race Guide which will be given to all the runners at the Expo. How do I get back to start point after finishing the race? After the completion of the event, runners may avail the complimentary bus service from GMC Balayogi Stadium back to start point or any point along the route. The first bus will leave at 9 am. What about parking at the start point? There are two parking lots available for Full Marathon & Half Marathon near the start point, at the NTR Memorial. These have limited spaces and can be occupied on a “first come, first served basis”. We strongly recommend car pooling. Also, the roads will be blocked at 4 AM at Necklace road and 6 AM at G.M.C Balayogi Stadium on the race day. Please keep this in mind while planning your travel to the start point. For 10K Run & 5K Fun Run parking will available at HITEX Grounds, Madhapur. Note: Parking is at your own risk and the organizers of the Hyderabad Marathon are not liable for the same. What is the minimum age for the events? Note: Participants whose age is less than 18 years need to submit the parental consent form at the Expo. What about accommodation for runners who come from outside? We will attempt to support runners who come from outside Hyderabad with information about convenient places of stay close to the start or finish areas. How do I get to the event start point? The start point for the Full Marathon and Half Marathon is Peoples Plaza, Necklace Road and it is in the center of the city. It is easily accessible from all parts of the city. Runners availing cab services should request for a drop off either at NTR Memorial OR Prasads IMAX Theatre. It is a 5-10 minute walk to the start point from both these places. The start point for the 10K Run & 5K Fun Run is Hitex Grounds, Madhapur, and it is also easily accessible from all parts of the city. Runners availing cab services should request for a drop off at HITEX Grounds, Madhapur. How can I make changes in the submitted registration form for misspelled name / T-shirt size? 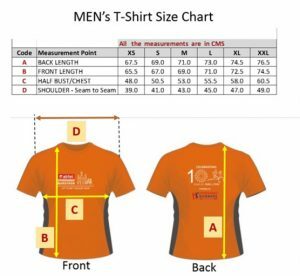 For any changes in the submitted form for the name or t-shirt size please write to info@marathonhyderabad.com. Can I get a refund or transfer / donate my registration? We do not have a refund policy. Once a registration is confirmed the registration fee is non-refundable. The registration is also non-transferable. To ensure that the timing is recorded, the Runner must cross all the timing mats provided at various locations. The Timing Certificate (Soft Copy) will be provided for runners who have completed the Full Marathon / Half Marathon/ 10K Run in under 6:30 hrs / 3:30 hours / 2 hours respectively. The 5K Fun Run is not a timed event and therefore will no timing certificate will be provided. What are the registration fees I have to pay? I haven’t received any confirmation / receipt for the event registered? What is the route for the events? The Full Marathon and the Half Marathon events will start from the Peoples Plaza on Necklace Road along the Hussain Sagar Lake and end at the GMC Balayogi Stadium in Gachibowli. The 10K Run will start at Hitex Expo Grounds, Madhapur and will end at the GMC Balayogi Stadium in Gachibowli. The 5K Fun Run will start and end at Hitex Expo Grounds, Madhapur. The route is subject to permissions from the concerned authorities and may be changed at a later date. 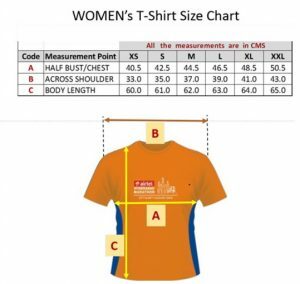 What are the T-Shirt sizes for the Hyderabad Marathon? The design and sizes shown below are indicative and may vary slightly in final design. Watch this space for updates. Who are the organizers of Hyderabad Marathon? The Hyderabad Marathon is being organized by Hyderabad Runners Society (HR), a non-profit organization which was founded in 2007 to encourage running among all age groups in the cities of Hyderabad and Secunderabad. It is the biggest running club in India and has more than 6,000 members with an extensive reach on social media. The club organizes 2-3 runs every week among other activities. It also organizes the Club Run once a year which draws more than 1000 participants. What are the race categories conducted for the Hyderabad Marathon? Full Marathon (42.195 KM), Half Marathon (21.098 KM), 10K & 5K Fun Run. How is the Terrain/Run Route? The route for the Full Marathon and Half Marathon is certainly challenging! With a combination of rolling hills and three flyovers, we promise you “it’s a challenge worth every step”. A well planned training schedule containing sufficient hill training will go a long way. The 10K Run and 5K Fun Run follow an easier and relatively flatter route, with the 10K Run having only one flyover as part of the route.